Imagine an 80s battle, set in space, with a keytar player, all out space rocker and a Cluster Pays reel-case separating the two. Now you have an idea of what this space age Foxium slot is like. 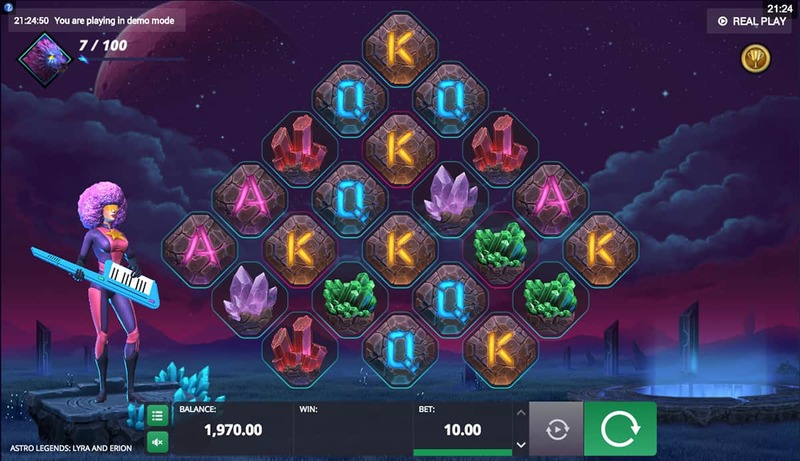 Astro Legends Slot : Lyra and Erion gives us the chance to enjoy a battle between two amazing characters, all while we play our way towards winning 15,000 times our stake. Fans of the 80s and the colour purple will love Astro Legends as they are two elements that are prevalent on the slot. Set on a distant planet, the violet background is further reinforced by the character of Lyra who appears on the left of the screen. Golden glasses, a gold star emblazoned across her chest and a bright blue keytar in hand, she’s raring to go. And of course, she’s completely dressed in purple with a massive purple afro. As if she couldn’t get any more 80s, the music kicks in and she gyrates along to her tunes in emphatic fashion. To the right of the reels, we see Erion, a rock beast intent on destroying Lyra’s planet. As rock beasts go, he looks rather bould(er) and we can’t but lament that he doesn’t have a mullet. 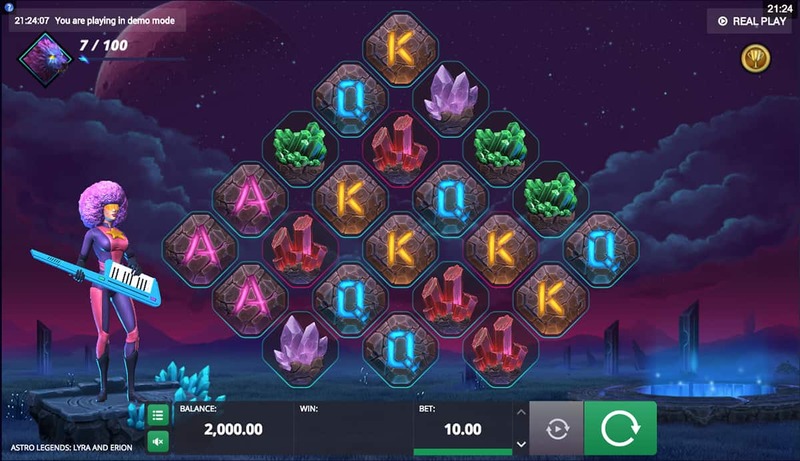 Astro Legends is a Cluster Pays slot, which means we have 22 symbols set out in an unconventional diamond layout on the screen. There are only six symbols, the Garnet, Amethyst, Peridot and rune designed card values, Ace, King and Queen. 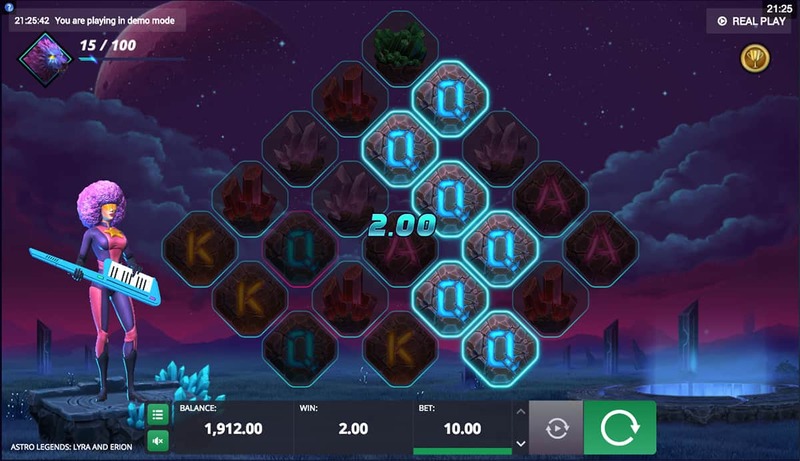 During each spin, Lyra is keytaring away as she does battle with her foe while we try to land symbols in clusters to form winning combos, either vertically or horizontally. Essentially, we need to create a cluster of five or more matching symbols to land a win. 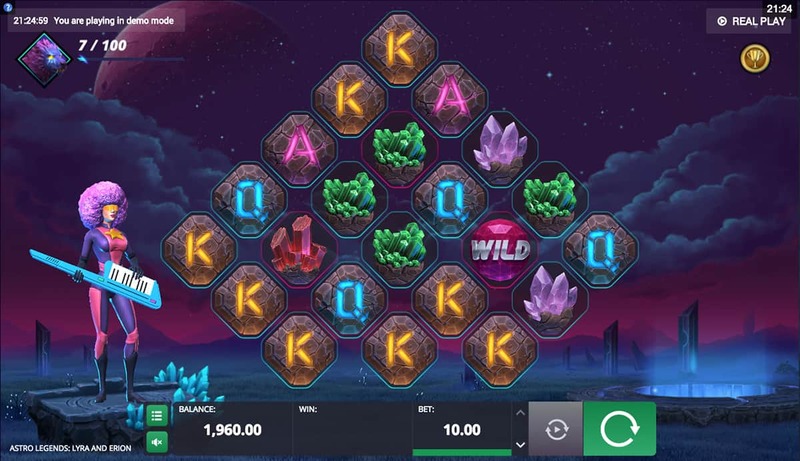 Wild symbols substitute for all symbols and award multipliers between x2-x5 when they form winning combos to sweeten the deal. The Sonic Respin feature can be triggered at random after a win, in which Erion appears and blocks all other reel positions while Lyra blasts them away with a strum of her instrument. After a cool little animation, we get Respins until there are no more matching symbols. If the star symbol floats onto the reels on any spin and Lyra bursts it, we get between 2-10 points to add towards the Lyra Spirit Bonus. Clearly signposted, 100 points triggers the round and Lyra transforms into a wolf (because, why not?) and we select a track for her to run across while she avoids Erion. Each successful level awards us a Multiplier for our wins. Intergalactic gameplay at its best! Foxium sure knows how to celebrate the 80s. Bizarre hairstyles, space age creatures, vibrant colours and of course, a keytar (have we mentioned it enough?). But it’s not just a celebration of that awesome decade. Astro Legends gives us a space adventure to remember. Two great characters, Cluster Pays and fun, rewarding bonus features will take your slots play out of this world.